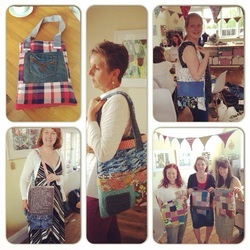 Your finished #Sewingrevolution Makes and Testimonials. Upcycle Bag- DC Nutt . J. Mason - I felt like I started the day clueless. I've now learnt how to thread a machine and i've created something that I can really be proud of!! Jenni gave me confidence to explore my newly acquired skill and gave us all great instruction that was easy to follow and allowed us to be creative. A.Thomas - clear, precise explanations. Patient and had an awareness of each participants work. Fun, Creative and Engaging. T.Thomas - A Fun day. jenni had some very useful tips which she freely passed on. Jenni demonstrated excellent patience and supported everyone at their own pace. Inspiring and Insightful. Rachel - Jenni is encouraging, creative and fun. Very relaxing. L. Chew - Very relaxed and encouraging environment where everyone was 'gently' pushed to complete a finished item. A very productive day :) ! Sewing clinic- Guthrie and Ghani. Juile Brown - very inspirational course and fantastic tutor. Would highly recommend. 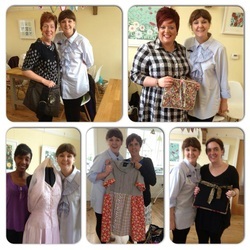 Lorna Brewster - Really enjoyable day and has opened my eyes to the possibilites to upcycling. Penny Loughlin-Smith - really great day. I had such fun and learned loads of ew things. inspiring and creative. 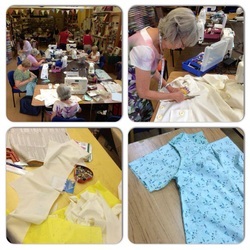 Rachel Smith-Chopra - sewing clinic what a great idea to kick start my enthusiasm for sewing. looking forward to upcycling more clothes. Lynda Packer- fantastic day. 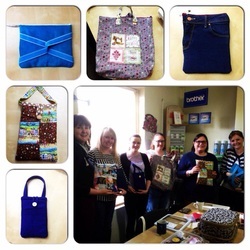 Everyone came away with finished items and all so varied. wonderful inspirational lady. Upcycle Ipad - DC Nutt. Kate Rees - Loved the workshop. Found it fun and informative. Would like to know of any other workshops you are doing and I would definitely recommend it to friends. Have had compliments about my iPad case and it has made me get my sewing machine out again. Cara Keeling - A really nice laid back workshop that was focused on enjoying yourself while learning at the same time, I had a great time. Jo Osborn - Wonderful! Enthusiastic and finshed with a top I can wear again. Shirley A - Very good and enjoyable class would recommend highly. Hilary Smith - Easy to understand, clear instructions and guidance. Inspiring. Jennie Capewell - New techniques - very good. Fiona M - Fun and Creative. 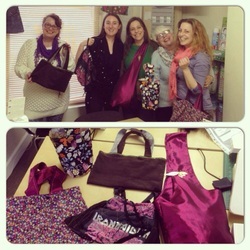 Upcycle Bags - Guthrie & Ghani. 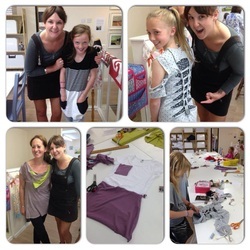 Jo Hazeldine - It was a fantastic experiment,I would certainly do another workshop. Jo M - Excellent course. Teacher really patient and very helpful. I really loved the experience and will definitely be buying my own sewing machine. Fantastic! Meila Smerdon-White - Hard work, Fun, Creative, Inspiring, Beneficial. Ali Goddard - Good fun day, Fantastic creative environment, friendly members of the group. Confidence building. Thanks Jenni I really enjoyed my day. Beckie Paterson - Excellent workshop. Jenni was really helpful and sorted out my many problems. I've learnt loads that I can use in the future. Louise P - Thank you very much, I really enjoyed the day. Was very relaxed, chilled in a great atmosphere and surroundings. Amanda Archer - Brilliant! love coming here want to do all the workshops! Meg Jones - I thought it was very good and fun. there was lots to different things to do! Sarah Jones - Really enjoyed it. Couldn't sew at all! My introduction to a sewing machine was not as frightening as I expected. Want to do more now! Amelia - it was good. it was EPIC. lovely workshop lovely atmosphere. 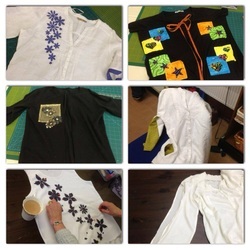 Lisa B - lots of help and support, practical tips demonstrations and hints. loved it. Alice Gilliver - really enjoyed this class. really pleased with my end product. Jenni was very patient and vibrant. Fiona S - Jenni was an excellent instructor very helpful. Pauline Morgan - thanks for a helpful, fun and enjoyable day. Hilary Smith - really enjoyed the course. relaxing pace suited everyone. Took into account everyone's level of expertise. easy to understand explanations. Liz Quinton - really enjoyed the class. nice easy pace. Like that we learnt off other peoples alterations as well. Jo Osborn - really informative and I've learned a lot. Would be better over two days! fun and creative. Jackie Robinson - enjoyed the clinic, very helpful. fun restructuring my sleeve. great! Dawn Addis - very helpful as a beginner it was good to have help and be able to ask questions, inspiring! Jennie Capewell - very good and informative, insightful and inspiring.